You begin your year with 70 per cent and sometimes 80 per cent of the planets above the horizon in the upper part of the Horoscope. Your 10th career house is very powerful all month, but especially until the 19th. You are in the midst of a yearly career peak. You are in the noon time of your year. Focus on the career and your outer, worldly objectives. You can safely let go of home and family issues for a while. You can best serve your family by succeeding in the outer world. This is a month of great career progress: pay rises and promotions are likely. Last month the planets began to shift from the Western, social, sector of your chart to the Eastern sector. This month, on the 19th, the shift is even stronger. The Eastern, independent, sector is now dominant. As our regular readers know, this is a time to take charge of your destiny, to shape conditions and circumstances the way you want them to be to create your personal nirvana. You have the power to do it now. Others will most likely go along with you, but if not, you can go it alone. After six or so months with the planets in the West, where you were forced to adapt to situations, you can readily see what needs changing and can now set about fixing things. During this month 90 per cent of the planets are in forward motion, and by the end of the month ALL the planets will be forward. So this is a fast-paced kind of month and you should see rapid progress towards your goals. January is a very good month for both love and money. Venus, both your financial planet and your love planet, is in Sagittarius until the 19th. This indicates increased earnings, luck in speculations and a generally upbeat attitude to finance. Sure, there are some problems, but you have the faith and the confidence to deal with them. 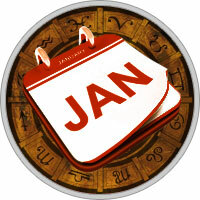 After January 10 Venus crosses the Mid-heaven and moves into your 10th house of career. This shows pay raises. Financial opportunity comes from your good professional reputation and from the financial favour of bosses, elders and authority figures -perhaps even from the government. If you have issues with the government it might be advisable to handle them after the 19th. The financial planet in Capricorn after the 19th indicates a sound financial judgement, a good long-term perspective on finance. Before the 19th you are a free spender, perhaps an impulse spender. Afterwards you seem more responsible. Your spouse or current love is making dramatic financial changes these days. He or she seems stressed. You seem the bigger earner right now. For singles there are love opportunities in foreign lands and in educational or religious-type settings. Until the 19th you are impulsive in love, but caution and perhaps testing will come after the 19th. The question is, can you restrain your ardour while your love planet is in Capricorn? Health is good overall, but this is not one of your best months. Rest and relax more until the 19th. Happily you seem focused more on health this month and this is good news.